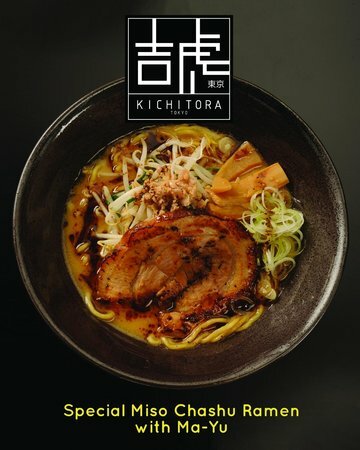 First up for me is Kichitora of Tokyo (2F SM Megamall Atrium), it has the best Tsukemen and Gyoza that we have tasted so far, I know it's a bit pricey, but if you have the dough to spare and like Japanese Ramen, this is the place to go. We have compared this to Mitsuyado Sei-men in Jupiter St., Makati, but we still choose Kitchitora over it, although you can check out both and tell us what you think, and taste, and feel, and alright I'll stop there. Next, me and my wife loves beef so much we actually spend quite a lot on our beef escapades, until we met BrickFire (Katipunan, 2F Xavier Residence Building, E. Abada corner R. Alvero Streets, Loyola Heights, Quezon City), they have this huge piece of T-Bone Steak for only 145 Pesos, it is really a steal if you compare it to Tender Bob's (Greenhills, Shangri-la) where this kind of cut is about 400 Pesos and above. The Chili is also nice for 80 Pesos, some say it's more of a Filipino take on the classic Chili, but I say, traditional or not this is one Chili that you don't want to miss. Disclaimer: Pictures are not mine, unless stated so. "God determines who walks into your life. It is up to you to decide who you let walk away, who you let stay, and who you refuse to let go." I enjoyed Kebab Factory very much. It was sad they had to close the Megamall branch. I want to try Mister Kabab at UP-Ayala just to check if they still tasted awesome. The one in West Ave slightly changed in the taste department. It's okay but not like what I remember it to be. Current Status: poor. no money! I heard they changed chefs. Today my wife and I discovered Yellow con yelo in Robinson's Metro East, 3rd Level. big bowl for Mais Con Yelo, P27! There were other 'con yelo' offering. Mang Raul's BBQ in BF Almanza, I've tasted their isaw and the spicy mix sauce is the best. Hole-in-the-wall Restaurants? Hmmm.. As of the moment, there's one in my mind for this category, Chihuahua Mexican Grill (Makati Ave.) they serve Tex-Mex style cuisine, complete with authentic guacamole and have huge American-sized servings. They come at a price though, you have been warned. I recently found out that Family Mart is way better than 7-11!!! Their selections are more upscale and deym! They look utterly delish! !